I haven’t had much time to write lately – too busy writing Vensim code, working on En-ROADS, and modeling the STEM workforce. This can be a powerful way to ingest a lot of data from diverse sources, and to share and archive simulations. Big data is always a double-edged sword in consulting projects. Without it, you don’t know much. But with it, your time is consumed with discovering all the flaws of the data, which remain because most likely no one else ever looked at it seriously from a strategic/dynamic perspective before. It’s typically transactionally correct, because people verify that they get their orders and paychecks. But at an aggregate level it’s often rife with categorization mismatches across organizational boundaries and other pathologies. Converting data from public sources and business archives into quality material, suitable for use in modeling, is often equally arduous if not quite so disgusting. Just substitute “back office systems” for “slaughterhouses,” “basement paper archives” for “fatty tissue, bones, and offal,” etc. Electronic systems create vast quantities of the stuff, but much of it could be aptly described as “deadstock.” The problem is that people can easily tolerate some dreck in material that they’re just browsing for information, so systems don’t go to great lengths to eliminate it. 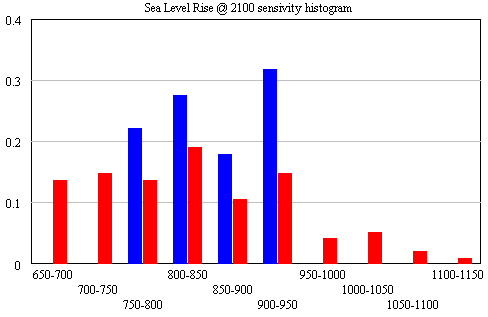 Models are pickier – a few extra zeroes somewhere can really affect calibration, for example. There’s an interesting new weapon in the war against arcane formats, inconsistent field coding and other data flaws, google refine. It’s apparently a Freebase spinoff. I’ve only used it for one task so far: grouping ad hoc text in a column, recognizing that “Ventana Systems,” “Ventana Systems, Inc.,” and “Ventanna Systems” all mean the same thing. It has useful filtering and clustering tools that largely automate such painful manual tasks. It can also do something else I’ve often hungered for in the past: transform an indented list into a table format. I suspect there’s much more depth that I haven’t even seen. Best of all, it’s fairly easy to get started. It won’t cure all sins of corporate data management, like throwing away everything more than a few years old, but I’ll definitely reach for it next time I have a platefull of messy data to clean up for a model. Check it out. No animals were harmed in the writing of this post. Tableau + Vensim = ? A year or two back, I created a tool, based on VisAD, that uses the Vensim .dll to do multidimensional visualization of model output. It’s much cruder, but cooler in one way: it does interactive 3D. Anyway, I hoped that Tableau, used with Vensim, would be a good replacement for my unfinished tool. After some experimentation, I think there’s a lot of potential, but it’s not going to be the match made in heaven that I hoped for. Cycle time is one obstacle: data can be exported from Vensim in .tab, .xls, or a relational table format (known as “data list” in the export dialog). If you go the text route (.tab), you have to pass through Excel to convert it to .csv, which Tableau reads. If you go the .xls route, you don’t need to pass through Excel, but may need to close/open the Tableau workspace to avoid file lock collisions. The relational format works, but yields a fundamentally different description of the data, which may be harder to work with. I think where the pairing might really shine is with model output exported to a database server via Vensim’s ODBC features. I’m lukewarm on doing that with relational databases, because they just don’t get time series. A multidimensional database would be much better, but unfortunately I don’t have time to try at the moment. 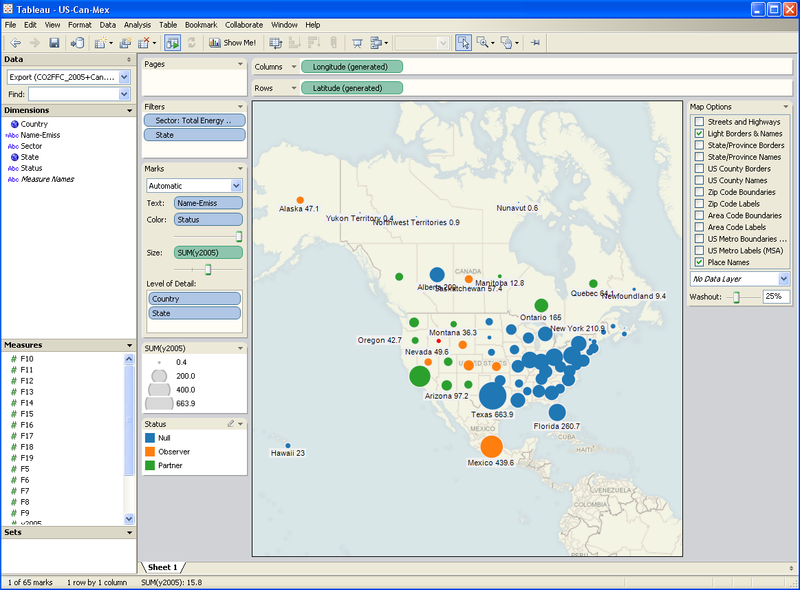 Whether it works with models or not, Tableau is a nice tool, and I’d recommend a test drive. 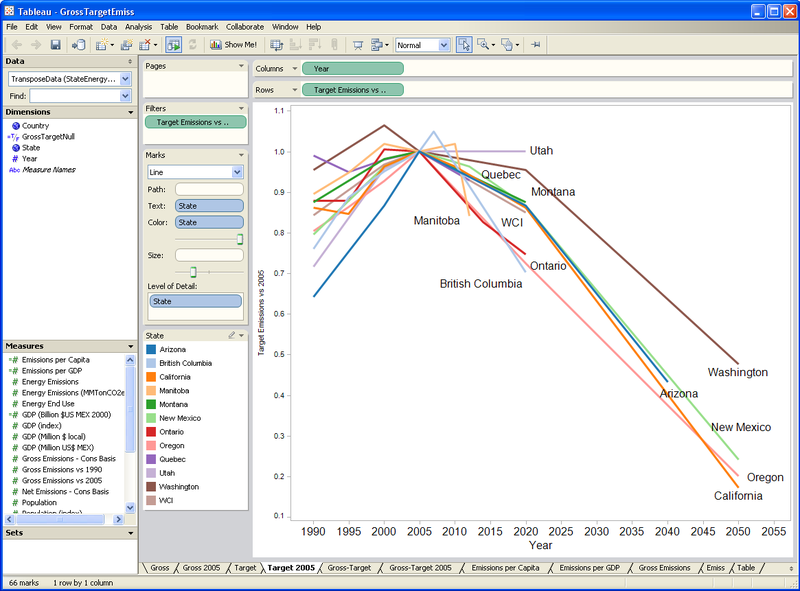 Author TomPosted on October 22, 2009 Categories SystemDynamics, Vensim, visualizationTags data, Tableau, Vensim, visualization2 Comments on Tableau + Vensim = ?